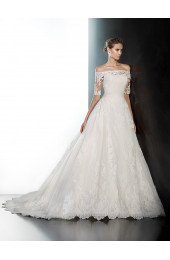 When it comes to choosing wedding dresses, and dresses for others in the wedding party, there is certainly no shortage of options to choose from. Many designers love making these beautiful dresses because of the fact that they are so popular, and it allows the designers to become a part of so many exciting events. When it comes to dresses for weddings, one of the most popular and best loved designers is Pronovias. These dresses have a classic, timeless look to them, while still embracing many modern style techniques to ensure they look good today and long into the future. Every year thousands of brides, flower girls, mothers of the bride and others wear Pronovias for their big day, and it is really no surprise why. If you are interested in looking at these great dresses in the Brooklyn, New York area, make sure you stop in our shop. Our friendly sales staff will be more than happy to show you what we have and help you to find the perfect dress for everyone. 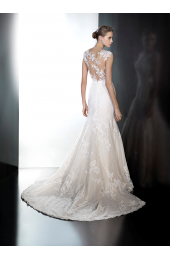 One of the most popular options for Pronovias is the wedding dress. They are designed to be absolutely stunning at all times. There are many different style options to select from so no matter what your personal taste, body type or other factors you have, you’ll find a beautiful dress that fits perfectly and looks absolutely amazing. We are confident that we can help you find the ideal dress for your wedding whether it is still a year away, or it is starting to get down to the wire. In addition to the beautiful wedding gowns, you can also select dresses for your entire wedding party. You’ll have bride’s maids that actually look great and are happy with their cute dresses by Pronovias! The mother of the bride (and groom) can also look their best for the big day. Of course, we carry a wide range of cute flower girl dresses to make sure they have a day they will never forget too. When you work with us, you are sure to get exactly what you want every step of the way. While we certainly specialize in dresses, we also have a remarkable selection of other accessories including head pieces, shoes and more. The bottom line is we carry everything you need to look great at your wedding. If we don’t happen to have the item you need in stock, just let us know. We can special order it for you and have it here for you for your big day. If you have any questions or you want to make sure we have what you need, please don’t hesitate to stop in our shop, which is located at 1110 Ave U Brooklyn, NY 11223. You can also give us a call at 347-462-4941 to speak with one of our friendly and professional sales associates. We can help you throughout the process and ensure you end up with exactly what you need for your wedding. You feel love at first sight when you see dresses like this one. A mermaid ..
You know it's love at first sight if you see a dress like this one and your heart skips a bea.. Some dresses fit so well and streamline the silhouette so much, they feel like they've been d.. The lace blends into the body in this incredible mermaid dress. The skirt flows up into a V-neck ..
Femininity and sensuality are the essence of this mermaid dress in tulle, lace and thread embroid.. The flowers blossom directly on the skin of this beautiful mermaid style dress, in tulle and Chan.. This spectacular mermaid design flatters the figure, accentuating its femininity. 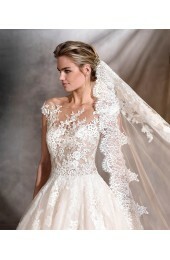 A dress that co..
Delicate flared empire line wedding dress. This beautiful, Ibiza-style wedding dress features bea.. This princess wedding dress is an ode to springtime. A masterpiece with floral motifs and details..
Bewitching, floaty wedding dress in gauze and tulle with a fitted waist and 3/4 sleeves. Unique, ..